RSG predicted in late 2015 that more DAM vendors would move to offer cloud-based products with varying degrees of sophistication. European vendors are currently leading the way with cloud-native DAM offerings, and new players arrive on a frequent basis. Larger vendors like Adobe, meanwhile, provide their DAM platform as part of a larger marketing cloud offering, more as an afterthought than as a targeted product. Here’s a view of what the cloud landscape for DAM looked like just two years ago. The shift from on-premise to a cloud or a SaaS (Software as a Service) offering — where licensing is based on TBs rather than servers, and charged like a subscription — changes your financial planning and budgeting from CapEx to OpEx. Companies must consider the people and managed services costs in tandem with the software subscription costs, since the former is frequently underestimated. As more old-school DAM vendors shift focus to the cloud with varying degrees of success — while simultaneously managing old networks of resellers and system integrators — some continue to produce little more than a cloud story rather than a real cloud platform. So remain skeptical of vendors’ claims about cloud deployments; talk to their customers. How long have they been deploying in the cloud, and can they scale across borders? Given this key trend, we now examine “Cloud Clout,” a measure of the experience that providers have with cloud deployments and environments, and how well the architecture takes advantage of cloud features. RSG cautions customers to distinguish carefully between managed hosting and on-demand, multitenant SaaS platforms. Not all vendor cloud offerings are created equally. 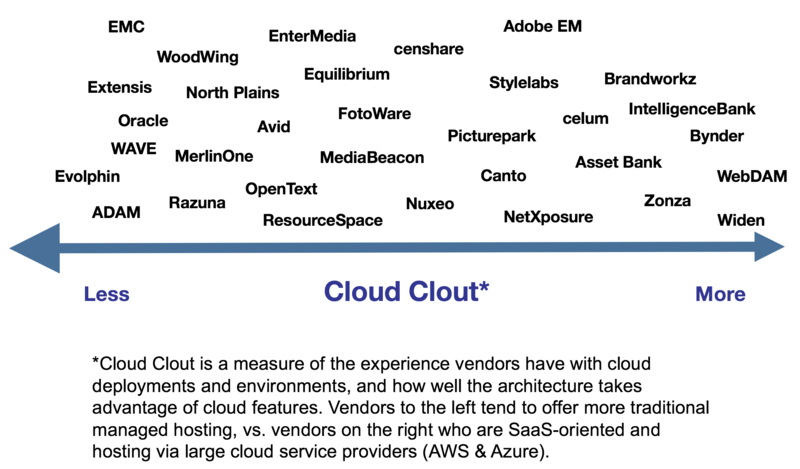 RSG's detailed DAM vendor evaluations go into a lot more depth about the cloud qualifications and genres of cloud offerings offered by these vendors. Be sure to look to our research not only if you're selecting a vendor, but also if you're considering whether or not your incumbent is qualified to take you to the sky. "Choosing a digital asset management solution was a daunting undertaking that was alleviated by our subscription with Real Story Group. RSG's research and advice benefited us greatly and insured that we made the correct decision. Not only did we save time and effort but we avoided wasting money on a digital asset management system that didn't fit our needs!"